One of the most celebrated deities in the ancient Greek pantheon was Artemis, the goddess who faithfully guarded the wilderness, childbirth, and women. Artemis never married, but the Fates made her a midwife. Chiron, a medically-minded centaur, named a very bitter herb in her honor: Artemisia. There are more than 300 different species of Artemisia found throughout the world. The International Herb Association has chosen this genus as its 2014 Herb of the Year. Artemisias are known for their strong bitterness. While we may not consider bitter very tasty, it can play an important role in purifying the body. To balance salty and sweet flavors, ancient culinary traditions often included bitter foods. A bitter taste can stimulate digestion by triggering the gallbladder to produce more bile, which facilitates the breakdown of fats. For this reason, a beverage like coffee (one of the very few bitter foods embraced by the modern world) or a digestif liquor is often served at the end of a heavy meal. The most powerfully bitter of the Artemisia genus is wormwood (Artemisia absinthium). Ancient writings from the Bible to Shakespeare reference wormwood’s bitterness to describe a cold heart and hard times. A mature wormwood looks like a silvery shrub. When in bloom it produces small fragrant yellow flowers. 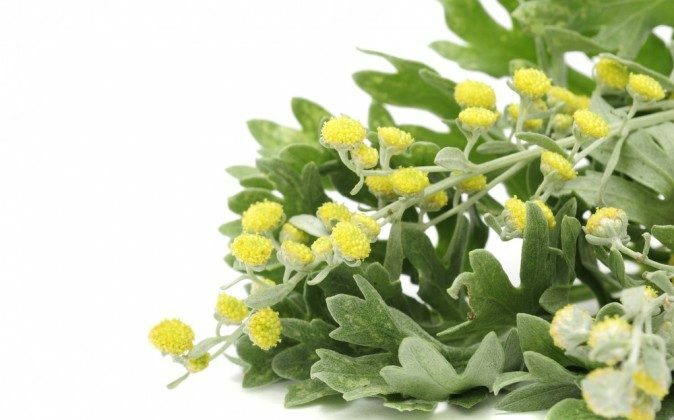 As the name suggests, wormwood helps rid the body of parasites (worms, and other small, intrusive creatures), and like other bitter herbs wormwood also serves as a digestive aid. According to the ancient Roman physician Dioscorides wormwood guards against the ill effects of intoxication, and poison—including hemlock, toadstools, and bites from the sea dragon. Bitter herbs can also be used to address emotional imbalance, such as panic, anxiety, and depression. Herbalists use wormwood to address the most extreme of these cases. In “The Book of Herbal Wisdom,” herbalist Matthew Wood describes wormwood as a remedy for those who have endured harsh and dehumanizing events. “It is particularly suited to patients who have a lack of affect, a deadness in their personality, have suffered brutal circumstances, and have the potential to be brutal themselves,” he writes. Wormwood works best in very small doses, and the intensely bitter taste usually ensures people don’t take too much. However, mixed with sugar and distilled in alcohol, wormwood consumption becomes much more attractive. Wormwood is the key ingredient in absinthe—the notorious green liquor famously abused by European writers and artists at the dawn of the 20th century. Absinthe was originally brewed as a malarial preventative for soldiers, but its popularity soon spread throughout the continent, until it was banned in the early 1900s. Common Artemisia (Artemisia vulgaris) has small, fragrant flowers just like wormwood, but its deeply lobed leaves have a dark green front and a silver underside It often grows wild amongst other weeds. This plant is probably best known as mugwort and has enjoyed a long history as both a medicine and a divinatory device to protect against evil spirits. In her 1931 Modern Herbal, British herbalist Maude Grieve said that the mugwort name comes from its anti-parasite reputation. Weed calls this plant “cronewort,” because it is everything an old woman wants. “I comfort those who grieve; I stir those who are depressed. I remove irritability and ease burdened joints. I bring peace and sleep, rest and reassurance,” she writes. The herb is a longtime favorite for women of all ages, due in large part for its affinity for the uterus—easing labor pain, menstrual cramps, and heavy bleeding. Mugwort can be used by both men and women. Weed says it benefits many systems: urinary, digestive, hormonal, nervous, and circulatory. Ancient Chinese doctors discovered that burning a tightly bound bundle of mugwort over certain acupuncture points can drive cold energy out of the body. Acupuncturists still use this moxibustion technique to warm stiff joints, relieve menstrual cramps, and turn a breech fetus inside the womb. 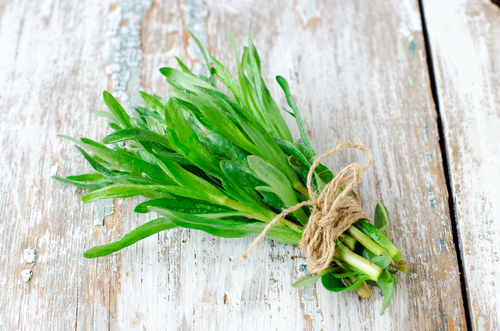 Tarragon is much more delicate looking than the medicinal Artimisas. More sweet than bitter, tarragon’s character lends itself well to culinary applications like flavoring tomato or cream sauces. 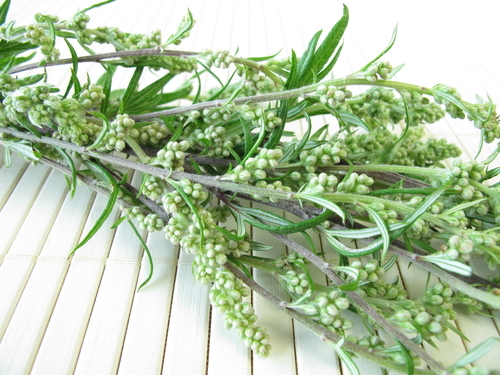 In general, Artemisias are known for their aromatic quality due to high concentrations of essential oils, and with its unique licorice-anise scent, tarragon is one of the four major herbs of French cuisine. Sweet Annie (Artemisia annua) is the Artemisia that has caught the most attention of modern medicine. 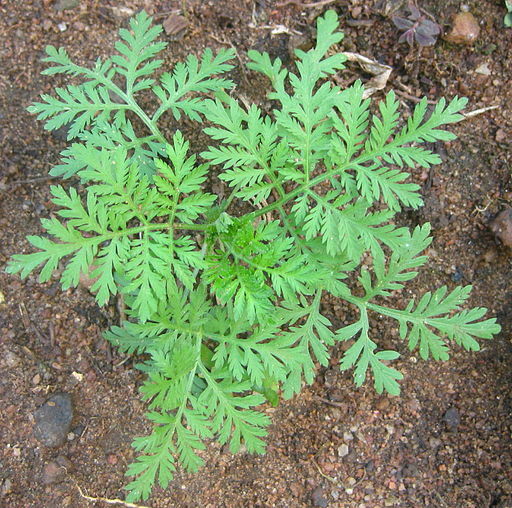 A chemical extracted from sweet Annie called artemisinin is used to produce an effective anti-malaria drug. Sometimes called Chinese wormwood, it has been researched more than any other Chinese herb. • Artemisias belong to the Asteraceae family—a group that includes sunflowers, asters, and daisies. • Many Artemisias grow wild, and are often found in waste places throughout the world. However, some varieties are cultivated for ornamental gardens—such as Silver King (Artemisia ludoviciana) and Dusty Miller (Artemisia stelleriana)—with a distinct touch of silver. • Artemisias are abundant in oils, including camphor and thujone. These oils serve as a natural pest repellant, and give the plants a refreshing scent. • Mugwort placed under your pillow is said to conjure good dreams. It seems like every person I talk to suffers from some form of fatigue.